The Ethics Commission is pleased to present this report on the activities, progress, and accomplishments of its twentieth year of operation to the Mayor, Board of Supervisors, and citizens of San Francisco. 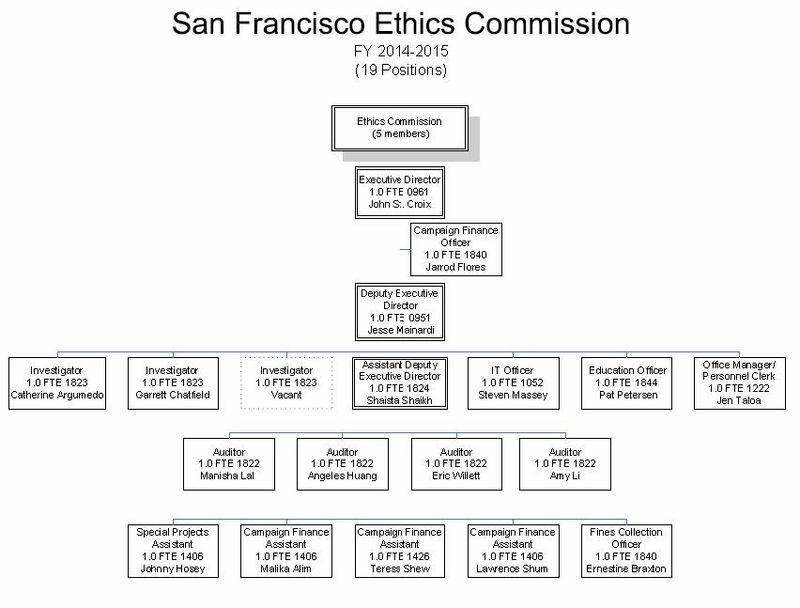 The Ethics Commission serves the citizens of San Francisco, candidates for City office, and City employees, elected and appointed officials by enforcing the City’s governmental ethics laws, providing education about their provisions, and serving as a repository for related information. The Commission acts as filing officer for financial disclosure statements related to City officials, campaigns, lobbyists, permit consultants, and major developers; audits certain of these financial statements for compliance with state and local laws; investigates complaints alleging ethics and political law violations; raises public awareness of ethics and political laws; researches and proposes ethics and political law-related legislative changes; and provides ethics and political law advice to City candidates, officeholders, officers, employees and to the general public. The Commission is pledged to a high standard of excellence in government accountability, and to that end has worked not only to implement the law, but also to amend existing law or create new law that will further the voters’ right to know and ensure integrity in government decision-making and in the campaigns of those who wish to govern. Updated and streamlined certain campaign reporting and disclaimer requirements. Approved regulations clarifying and otherwise interpreting the City’s Lobbyist Ordinance. Implemented new requirements for lobbyists, permit consultants, and major developers. Substantially reduced the Commission’s audit backlog. Imposed fines totaling $35,950 for violations of laws under the Commission’s jurisdiction and issued a Forfeiture Letter seeking to recover $190,903.04. Developed policies to facilitate the handling of Sunshine Ordinance referrals. Placed a measure to regulate “expenditure lobbyists” on the November 3, 2015 ballot which became Proposition C on that ballot. Continued to be an industry leader in campaign finance data visualizations and open data. *Performance data for the Commission collected by the Controller’s Office is also available for review at http://sfcontroller.org/Modules/ShowDocument.aspx?documentid=6946 (See pg. 39.) This data reflects the Commission’s performance with respect to resolving complaints, completing audits, promoting timely filings, and conducting staff performance appraisals. Local candidate and ballot measure campaigns are regulated by the City’s Campaign Finance Reform Ordinance (“CFRO”), which incorporates state campaign finance law and imposes a number of additional reporting requirements and limitations. Eliminated redundant mass mailing, persuasion poll and “$5,000 report” disclosure requirements. Imposed a new member communications reporting requirement. Standardized the reporting period and thresholds for independent expenditures, electioneering communications, and member communications. Required the filing of copies of all reported independent expenditures, electioneering communications, and member communications. Standardized the City’s various disclaimer requirements to more closely track state law. The Commission’s changes were ultimately approved by the Board of Supervisors and the Mayor in June 2015, and took effect the following month. Commission staff worked to produce required forms and Fact Sheets for the November 2015 election. Also, the Commission held a special public hearing on June 5, 2015 and received testimony from experts Robert Stern and Corey Cook, and from members of the public, regarding the potential need for, and the implications of, imposing campaign contribution limits on candidate-controlled ballot measure committees and/or legal defense funds. Additionally, at its April 27, 2015 meeting, Chair Renne appointed Commissioner Keane to analyze and make recommendations with respect to potential ballot measures re-imposing “expenditure lobbyist” reporting as well as some of the limitations included in Proposition J approved by voters in 2003 but which have since been eliminated. Commissioner Keane concluded that Proposition J should be addressed the following year given the range of associated issues. Finally, the Commission distributed $194,710 in public financing from the Election Campaign Fund to two candidates for Supervisor in District 10 in connection with the November 4, 2014 election. The Commission also distributed $40,000 in public financing to two candidates for Supervisor in District 3 in connection with the November 3, 2015 election. The Commission serves as the filing officer for campaign statements filed by San Francisco candidates and other committees that support or oppose local ballot measures or candidates. The Commission conducts audits of certain committees that are selected under a random selection process and mandatory audits of publicly funded candidates. This year, the Commission randomly selected ten campaign committees for audits from a pool of 60 committees that were active in elections during the calendar year 2014. Also, for the first time, the Commission randomly selected four lobbyists active in 2014 for audit. The four lobbyists were chosen from a pool of 37. Finally, with help from the Controller’s office, the Commission’s auditors reduced its audit backlog by completing 31 audits during the fiscal year. As June 30, 2015, there were 14 uncompleted audits, which are scheduled to be completed during the first half of FY 15-16. In FY 2014-15, 482 City officers (e.g., commissioners, board members, department heads and elected officials) filed their Statements of Economic Interests (Form 700) electronically with the Ethics Commission. Staff also received 390 Certificates of Ethics Training and 386 Sunshine Ordinance Declarations, which were submitted on paper and processed manually. There were 45 late-filed annual Form 700s (9%), which is an increase from the 32 late-filed reports in 2014 (6%). Three filers have been referred to the Fair Political Practices Commission for non-filing. Staff will continue its efforts to lower the number of late- and non-filers. At its June 29, 2015 meeting, the Commission discussed a draft regulation that would expanded the electronic filing requirement to all of the City’s so-called “designated filers” who currently file their Form 700 in paper format with their own department. In light of certain concerns voiced by union representatives, the Commission directed staff to engage in “meet and discuss” meetings with those representatives to be facilitated by the Department of Human Resources. There was much Commission activity this year with regard the City’s Lobbyist Ordinance, which requires local lobbyists to register with the City and file monthly electronic reports about their activity intended to influence local legislative or administrative action. In the wake of legislation passed in the prior fiscal year amending the Lobbyist Ordinance, the Commission approved certain regulations implementing and interpreting that ordinance at its July 28, 2014 meeting. Among other things, the approved regulations defined those activities that constitute “arranging” contributions. This regulation has led to increased reporting of such arranged contributions. The changes to the ordinance, which eliminated the monetary threshold necessary to qualify as a City lobbyist and replaced it with a bright-line “contacts” test, resulted in an increase in the number of registered City lobbyists. At the end of FY 14-15, 137 individual lobbyists were registered with the Commission, which was an increase over the last fiscal year of 100 lobbyists. Registered lobbyists reported receiving $6,929,124 in promised payments. Total revenues collected by the Commission amounted to $95,050, including $95,000 in lobbyist registration fees and $50 in late fines. In light of all the new changes, Commission staff published a new Lobbyist Manual as well as a new Lobbyist Training Video. Both are posted on the Commission’s website. Commission staff also worked with law students from the UC Hastings Center for State & Local Government Law to produce fact sheets summarizing the requirements of the Lobbyist Ordinance in plain English. The Fact Sheets are also posted on the Commission’s website. As noted earlier in this Report, Chair Renne appointed Commissioner Keane to analyze and make recommendations with respect to potential ballot measures re-imposing “expenditure lobbyist” reporting as well as some of the limitations included in Proposition J approved by voters in 2003 but which have since been eliminated. After concluding that Proposition J issues should be addressed the following year, Chair Renne requested that he prepare a proposed ballot measure dealing with expenditure lobbyist issues. With the assistance of Friends of Ethics, Commissioner Keane developed a proposal to amend the Lobbyist Ordinance to impose reporting requirements on expenditure lobbyists that seek to engage members of the public to lobby City officials. The full Commission considered and took public input on this proposal at its May 27 and June 29, 2015 meetings. Staff also took public input on the proposal, including at an interested persons meeting on June 10, 2015. The Commission voted unanimously to place this proposal – ultimately designated Proposition C – on the November 3, 2015 ballot at its June 29, 2015 meeting. As part of the legislation from the prior fiscal year amending the Lobbyist Ordinance, similar registration and reporting requirements were imposed for the first time on so-called “permit consultants,” who are paid to contact the Department of Building Inspection, the Entertainment Commission, the Planning Department, or the Department of Public Works to facilitate the approval of certain City permits. Effective January 1, 2015, these permit consultants have been required to register and file quarterly reports with the Commission disclosing client information, compensation, City officers and employees contacted, the relevant permits, and certain contribution information. After passage of the legislation, Commission staff worked to timely produce and disseminate required registration and reporting forms and Fact Sheets by the January 1, 2015 effective date. Staff also conducted outreach via the Department of Building Inspection and the Planning Department regarding the new requirements. As of June 30, 2015, 44 permit consultants had registered with the Ethics Commission. All registered campaign consultants filed the required quarterly reports. Out of 90 reports filed with the Commission, 22 were filed after the required deadline. Permit consultants reported receiving approximately $2,962,631 in payments from registered clients. Also part of the Lobbyist Ordinance legislation were new reporting requirements for developers of certain City real estate projects with an estimated construction cost of more than $1,000,000. Effective July 26, 2014, developers have been required to file five forms with the Commission over the course of about a year disclosing donations to nonprofit organizations that have contacted City officials about their project. The first form is due within 30 days of certification of an Environmental Impact Report (“EIR”) by a local agency or, if the project relies on a program EIR, within 30 days of the adoption of a final environmental determination under the California Environmental Quality Act. Disclosure is not required for a residential development project with four or fewer dwelling units. After passage of the legislation, Commission staff worked to timely produce and disseminate required reporting forms and Fact Sheets. Staff also conducted outreach via the Planning Department regarding the new requirements. Nevertheless, only three developers had registered with respect to five projects by June 30, 2015. Staff is investigating potential under-reporting. The Campaign Consultant Ordinance, passed in 1997, requires any individual or entity that earns $1,000 or more in a calendar year in exchange for providing campaign consultant services to register with the Ethics Commission and file quarterly disclosure statements. The Campaign Consultant Ordinance is the result of a voter referendum and is therefore not subject to changes without additional voter approval. Campaign consultants are required to report the names of clients, services provided for those clients, payments promised or received, political contributions, gifts made to local officials, and other information. Beginning with the first quarter of 2013, the Commission no longer issues quarterly report summaries of campaign consultant activity. Instead, information regarding all activity has been and will continue to be provided via the Campaign Consultant Activity Dashboard on the Commission’s website and made available for download through the City’s data.sfgov.org open data system. Staff continues to ensure that all consultants who are required to be registered with the Commission file their registration forms and pay their registration fees. During FY 2014-2015, 43 campaign consultants were registered with the Ethics Commission. All registered campaign consultants filed the required quarterly reports. Out of 112 reports filed with the Commission, 19 were filed after the required deadline. Campaign consultants reported receiving approximately $11.5 million in payments from registered clients. As of June 30, 2015, 20 consultants remained active and 22 clients were registered. The Ethics Commission has the authority to investigate complaints that allege violations of certain state and local laws that relate to campaign finance, conflicts of interest, lobbying, campaign consultants, permit consultants, major developers, and governmental ethics. During FY 2014-2015, 104 pending and/or new complaints were under review by the Commission’s enforcement staff. 83 complaints were resolved during the fiscal year; 56 of these complaints were determined not to be within the jurisdiction of the Commission and/or not to warrant further action. The Commission imposed $35,950 for various violations of law through stipulated settlements and/or administrative orders. Throughout the year, the Executive Director’s Reports submitted to the Commission at each of its regular meetings show the number of complaints that have warranted further action. Also, on December 9, 2014, the Ethics Commission demanded that Supervisor Mark Farrell forfeit $190,903.04 to the City and County of San Francisco. The state’s Fair Political Practices Commission had previously imposed a fine on Supervisor Farrell’s 2010 campaign consultant for coordinating with an independent expenditure committee. Therefore, the Commission determined that the independent expenditure committee had made $190,903.04 in excess “in-kind” contributions to Supervisor Farrell’s campaign. The Commission demanded forfeiture of $190,903.04 pursuant to S.F. Campaign and Governmental Conduct Code section 1.114(f). Although it re-considered the matter at a number of meetings in 2015, the Commission ultimately overruled Executive Director John St. Croix’s request to waive the forfeiture at its June 5, 2015 meeting. Cooperated with an investigation of a complaint conducted under the Ordinance. Abusing his or her City position to advance a private interest. Section 4.130 requires the Commission to provide an annual report to the Board of Supervisors, reporting certain information regarding complaints filed under Chapter IV during FY 2014-2015. That information is below. Type of conduct complained about. Various forms of retaliation, including termination, disciplinary action, reassignment, and harassment. Findings or recommendations on policies or practices resulting from the Ethics Commission’s investigations. See below. Number of disciplinary actions taken by the City as a result of complaints made to the Ethics Commission. Unknown. Number and amount of administrative penalties imposed by the Ethics Commission as a result of complaints made to the Commission. Zero/$0. Relatedly, on June 8, 2015, the 2014-2015 San Francisco Civil Grand Jury issued a report entitled “The Whistleblower Protection Ordinance Is In Need Of Change.” The report made a number of suggestions intended to increase the effectiveness of the ordinance, including suggestions that would expand the ordinance’s scope, impose additional remedies, and make procedural changes to the investigation process. The Commission considered the recommendations set forth in the report at its June 29, 2015 meeting and agreed to look into these issues in more detail. Enforcement regulations for handling violations of the Sunshine Ordinance went into effect on January 25, 2013. The Commission subsequently held a number of public hearings regarding violations of the Sunshine Ordinance pursuant to those regulations. Nevertheless, certain procedural and substantive issues related to referrals from the Sunshine Ordinance Task Force continued to arise, which impeded the ability of the Commission to effectively handle these referrals. Namely, the Commission struggled to address inconsistencies between the Task Force’s proceedings and its referrals, the degree to which departments and department heads should bear responsibility for their employees’ violations, and the meaning of the term “authorized representative” for purposes of the Ordinance. After receiving feedback from members of the Sunshine Ordinance Task Force, the Commission approved certain policies meant to address these issues, which it conveyed to the Task Force. The Commission continued to hear referrals from the Task Force, although such referrals were made less frequently. Giving a guest lecture on governmental ethics to a class of MPA candidates at the Presidio Graduate School in San Francisco. The Commission’s educator/outreach coordinator continues to help with these efforts, as well as efforts to update the Commission’s publications and training videos. The Commission is charged with interpreting and applying the campaign, lobbying and governmental ethics laws under its jurisdiction, requiring that it consider requests for waivers and issue formal and informal written advice on matters requiring interpretation. Commission staff is available each workday to answer public inquiries about City campaign, lobbying and governmental ethics laws. During the course of the year, the number of inquiries runs into the hundreds. Also, on an on-going basis staff provides training to candidates and campaign treasurers on using the Commission’s online electronic filing system, SFEDS. During FY 14-15, the Commission continued its efforts to improve electronic data access and migrate additional paper forms to electronic format. For the November 4, 2014 election, staff developed comprehensive dashboards to cover candidate and ballot measure races, late contributions, major donors, lobbyist contributions, and campaign consultant activity. In addition, staff published an innovative interactive rendition of Professor Justin Levitt’s “Democracy Facts” label. Staff received positive feedback from members of the public, regulated community, and other Ethics Commissions, some of which requested the source file for the Democracy Facts Label so that it could be reproduced in other cities. Tableau Software, the company that produces the software staff used to develop the visualizations, selected the Ballot Measure Dashboards as its “Viz of the Day” on October 14, 2014. The “Viz of the Day” is a data visualization selected from visualizations developed worldwide and is featured on a website where Tableau Software showcases innovative work produced with Tableau that meets various quality characteristics in the areas of the design, analysis and visual best practices. The Ballot Measure Dashboards will remain in a gallery on Tableau Software’s website as an example of quality visualizations from which users can learn to better use the software. Staff also worked with Code for America’s SF Brigade to educate its members on campaign finance and lobbyist data analysis. The group went on to publish their own data analysis of the November 4, 2014 election at transparentvoting.com. After the election, staff mentored two graduate interns, Kristen Wolslegel and Jeffrey Thorsby, from the San Francisco State University Public Administration Program. The students learned about campaign, lobbyist, and campaign consultant disclosure, how to conduct research, and produce data visualizations. The students finished their internship by producing a report entitled “Spending to Influence: Campaign Finance and Lobbying in San Francisco in 2014” which included a comprehensive assessment of election-related activity by political action committees, political parties, campaign consultants, major contributors, and lobbyists in the City throughout 2014. The report was published on the Commission’s website. On October 16, 2014, the Committee on Information Technology approved a metadata standard for City data published on the DataSF open data website. Commission staff was part of a working group that developed and drafted the standard. In May 2015, the Commission released a new component to its electronic filing system to allow candidates for Mayor and Board of Supervisors to submit qualifying and matching funds requests, all supporting documentation, and a variety of other forms related to the public financing program in electronic format. Commission staff will review applications in the new system and send responses back directly into the candidate’s filing account. Candidates that use the new public financing component will now only have to data enter contributions once for both public financing and disclosure forms. Candidates currently raising funds in anticipation of applying for the November 2016 election will be the first to use the new system. There were 164,447 “pageviews” of the Commission’s website, a 13 percent increase over FY 13-14. The Commission is a member of the Council on Governmental Ethics Laws (COGEL). Three persons on staff are members of the California State Bar Association. The Commission’s annual approved operating budget for FY 14-15 was $2,625,384, with actual spending equaling $2,551,610. An open position for part of the year and some unused temporary staff funding accounted for the $73,744 difference. The FY 14-15 budget also included an allocation of $1,948,970 to the Election Campaign Fund, $234,710 of which was distributed in FY 14-15 to two candidates for Supervisor in 2014 ($194,710) and two candidates for Supervisor in 2015 ($40,000). At table of the Commission’s annual approved budgets historically follows. Please note that starting with FY 02-03, deposits into the Election Campaign Fund, which are used exclusively for payments to publicly-financed candidates for Board of Supervisors and for Mayor, are noted. *Amounts corrected from prior reports. ** Included front-loaded funding for Mayoral Election Campaign Fund. *** Agencies Citywide absorbed across-the-board budget cuts. **** Included annual deposit of $2,009,451 for the Election Campaign Fund plus a repayment of $4,079,107 borrowed in previous years. Commissioner Ben Hur was elected to serve as Chair at the February 24, 2014 and Commissioner Paul Renne was elected to serve as Vice-Chair. Commissioner Paul Renne was elected to serve as Chair at the March 23, 2015 meeting and Commissioner Brett Andrews was elected to serve as Vice-Chair. The Ethics Commission had a staff of 18, supported by interns throughout the year. Staff included Executive Director John St. Croix; Deputy Executive Director Jesse Mainardi; Assistant Deputy Director Shaista Shaikh; Auditors Angeles Huang, Amy Li, Manisha Lal and Eric Willett; Office Manager Jen Taloa; Campaign Finance Officer Jarrod Flores; Fines Collection Officer Ernestine Braxton; Campaign Finance Assistants Teresa Shew, Malika Alim, and Lawrence Shum (who left his position during FY 2014-2015); Investigators Garrett Chatfield and Catherine Argumedo; IT Officer Steven Massey; Education and Outreach Coordinator Patricia Petersen and Special Projects Assistant Johnny Hosey. Sally Hong, and Lena Germinario, law students at UC Hastings. In May 2015, Executive Director John St. Croix announced his resignation after ten years of service. The Commission appointed Chair Renne and Vice-Chair Andrews to a committee to lead the hiring process for Mr. St. Croix’s replacement. That committee held a special meeting to solicit input from the public regarding the recruitment and selection process and the desired qualifications of the next Executive Director. The Commission later approved engaging the search firm Alliance Resource Consulting for the Executive Director recruitment process. Considering changes to its policies for handling late filers and non-filers. Continuing to address certain of the issues raised in its work plan from March 2015, including candidate-controlled ballot measure committees and bundling.